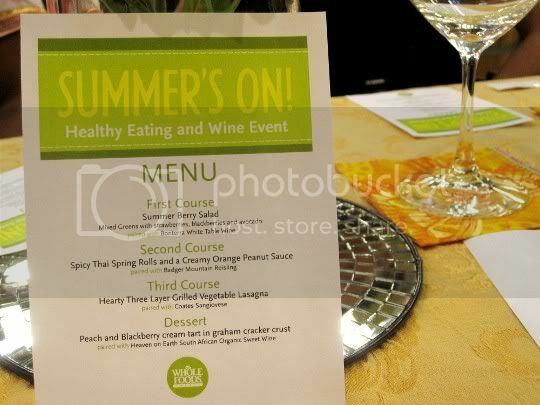 My first dinner at Whole Foods El Segundo (yes, the store) was, coincidentally, their first ever vegetarian wine dinner in the store's history. And imagine my surprise when after the 30 or so invitees arrived, it was announced that the dinner was actually 100% VEGAN (I suppose it was titled "vegetarian" as to attract more omnivoric folk)! Only $30 per person for four courses and four different glasses of wine...what a deal! Things were set up for us quite nicely: held in the Tapas Bar, surrounded by beer and wine, and intimately seated at tables covered in oranges, yellows, and greens. Fresh mini floral arrangements, vases, candles, and of course, wine glasses. The staff was friendly and very knowledgeable about the menu: Ellena, in particular, described every course in detail to the guests, down to specific ingredients. Not only did she explain that everything was pure vegan, but none of the dishes contained any oil, emphasizing that healthy eating can be GOOD and TASTY eating. Of course, a salad was in order for a veg meal. A bit predictable, but ah well. 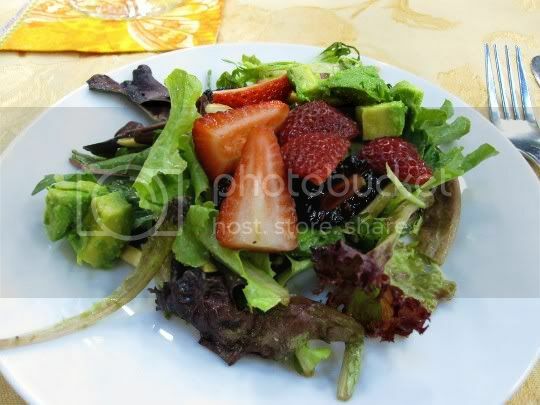 Mixed greens, heavy on the toasted almonds, tossed with diced avocado, sliced strawberries, and blackberries in a light citrusy-orange dressing. The avocado was a great addition to the salad, acting as an absolutely wonderful creamy and buttery complement to the tangy fruit. The wine was very fruity and light by itself, but I thought the flavor sort of flattened with the food flavors...I'm guessing due to the sweetness and tanginess of the fruit. These weren't quite the spring rolls I was expecting. 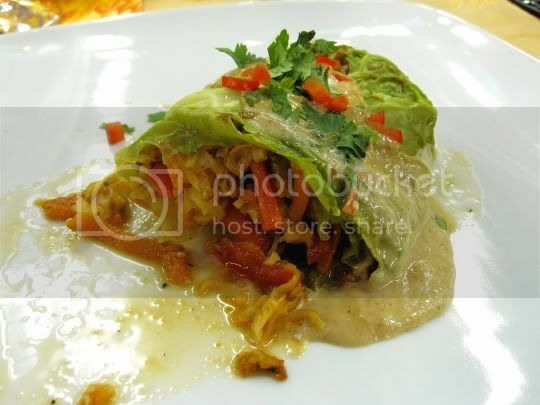 Instead of the traditional fresh veggies served cold wrapped in rice paper, these were served hot and wrapped in cabbage. Some tough leaves of cabbage, I might add. Aside from that (and better plate wiping for presentation skills), the rolls were quite good...almost like eating a warm Thai salad. The leaves were filled with a spicy blend of shredded cabbage, red bell peppers, carrots, mushrooms, and cilantro, and topped with an amazing dressing: I tasted peanut butter, rice wine vinegar, fresh ginger, maybe a little soy sauce. There's something about the flavor combinations of red bell pepper, peanuts, rice wine vinegar, and cilantro that just screams Asian cuisine, and this dish definitely had it. 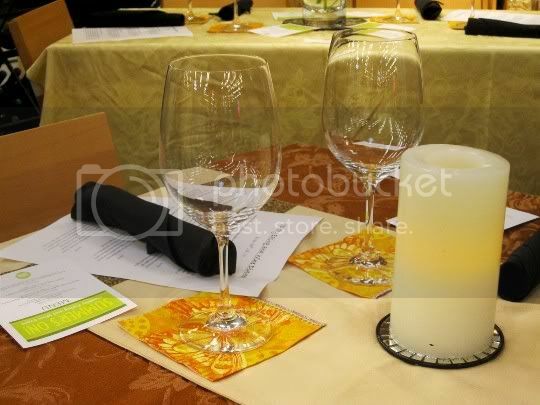 The riesling, best paired with spicy foods, really intensified with the food flavors. It was served cold, ice cold in fact...a little too cold, I thought. However, I could clearly make out pears and many floral notes, with a bit of spiciness from cardamom. Delicious (but maybe I'm biased, since riesling is my favorite)! Well, this wasn't really a lasagna...at least not in the traditional sense. This was more like a grilled vegetable stack, but was surprisingly hearty and filling. 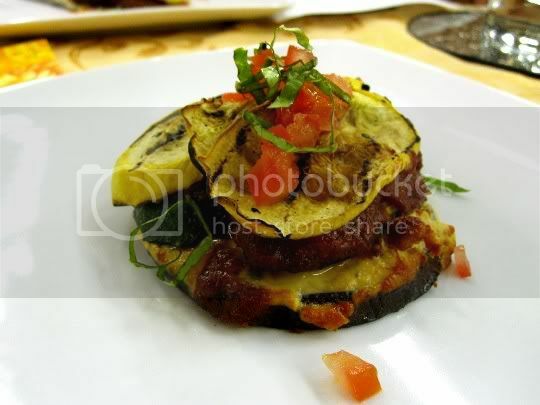 There was no actual pasta in this dish; instead, a layer each of grilled eggplant, zucchini, and yellow squash composed this meal, topped with diced tomatoes and fresh basil chiffonade. The sweet and aromatic sauce was an organic Whole Foods marinara, but cooked with mushrooms and red wine. But probably the most interesting component of this lasagna was the "cheese" in it: not the typical ricotta, but made from cashews. "Cashews?!?!" as one dumbfounded diner exclaimed. Yes, cashews. Creamy, sweet, rich, velvety: it's amazing what cashews can do for dairy stand-ins. Of course, I'm not saying it tasted like cheese, but it definitely did the job for providing a tasty, creamy, and rich filling. My first time tasting sangiovese, it had a wonderful aroma, medium body, and cherry-heavy flavor. In fact, the wine became more hearty with the lasagna, making this a nice entree pairing. A beautiful vegan dessert emphasizing seasonal fruits and nuts, this dish was refreshing, light, and a perfectly sweet way to end the meal. The baked "graham cracker" crust was VERY nutty and not overly sweet: comprised of ground almonds, cashews, almond flour, oats, and dates, with a noticeable cinnamon presence. It was topped with a cashew-based cream sweetened with agave nectar and a little soy milk added for extra creaminess. I think the soy milk added a bit of a tofu-like aftertaste, but it's a flavor I'm used to, so I didn't mind. 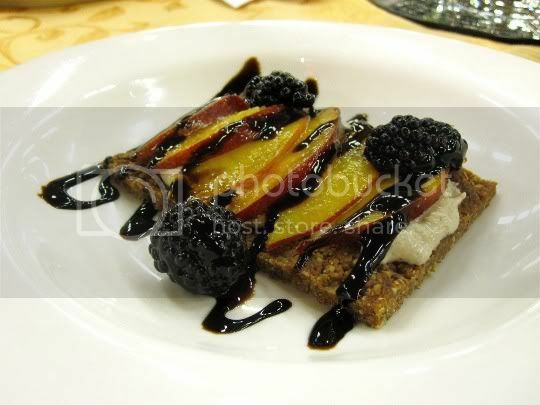 Organic peach slices and blackberries topped the cream, and a sweet and syrupy balsamic reduction was drizzled over the top. Yum! This was also my first time ever having dessert wine, and what have I been waiting for...it's soooo tasty! Extremely sweet and syrupy, it had a heavy apricot flavor with woodsy notes. I did notice a rather strong chemical-like aroma and flavor, especially emphasized when paired with the sweet dessert, but maybe that's normal...? 1) For a vegetarian meal, I thought the menu was a bit predictable. I was expecting some meat substitutes: seitan, tofu, tempeh, something "meaty." My theory is that the menu was designed to not be TOO veg (as if that's a bad thing), as to not scare away regular meat-eaters. You know, they won't have a problem eating vegetables, but they might be too afraid of anything "faux." 2) As a result of the menu being pretty much all vegetables and fruit, I have to admit, I didn't walk out feeling completely full. Since they're composed of anywhere from 75-95% water, everything is going to digest pretty quickly. I was hungry and literally CRAVING some protein or carbs about an hour later. So that would have been nice! Visit again? Definitely. Can't wait for the next one! I'm so glad you went to this! I've been standing by for your review. :) Good job on the wine comments. LOL! Awesome deal! I will be sure to attend the next dinner event at Whole Foods. 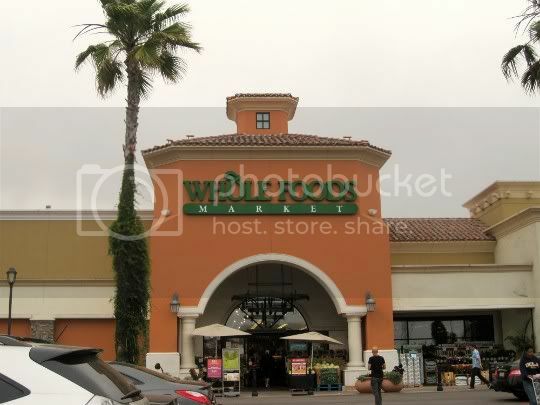 I LOVE the Plaza El Segundo location. Thanks! what a great event! looked like a great meal. too bad they don't do that in pittsburgh.